Laughing Mallard. I remember finishing my flute and hearing its sweet voice for the first time with the experience sending shivers down my spine and touching me deep within my soul. Since that time, I have proceeded to make every mistake in the book and even inventing some new ones. At that time, I had only heard of two other flute makers ... Ken Light and Scott Loomis. I finally met Scott one day and asked him how to properly tune a flute to a pentatonic scale. I'll never forget his reply, "Well, you drill the holes and if they're wrong, you plug and drill them again." He then proceeded to laugh and, at that time, we became friends. Later, while in Sacramento, I visited a small Native American gift shop where I met a young lady who introduced herself as Mary Youngblood. Mary played (...what a thrill...) and showed me a flute made by Lew Price and then brought out a book that he just finished called "Creating and Using the Native American Love Flute." As I opened the book, I nearly fainted for all of the information that I was seeking was right there in front of me. I thanked my new friend Mary, told her about my new flute quiver that I was working on, and ran to my hotel room to call Lew Price. Lew and I became best of friends as I continued to bug him while he wrote 11 more books and... the rest is history. several flutes that they enjoy, but none of them tell their own personal story. My challenge and focus is to take your vision and turn it into reality. 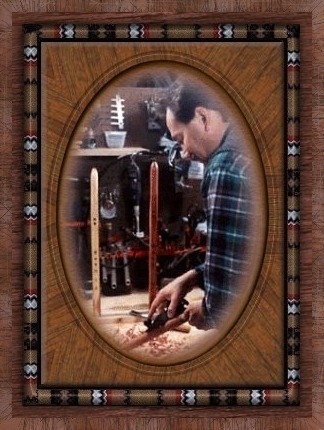 It has been a few years since we created the Custom Flute Shop and it has been a wonderful and rewarding experience. Along the way I have created special flutes for my close friends, Douglas Spotted Eagle, Gary Stroutsos, Charles Littleleaf, Bronze artist Dave McGary, and for flute players and friends all over the globe. I enjoy the flute making process and never have more than one flute on my bench at a time. When your flute is completed, only then do I move on to the next dream making sure that your personal flute is the best it can be. 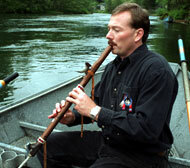 Upon finishing your flute it is always a thrill for me to step outside and play for all of friends along the river. We invite you to call us anytime and talk flutes with myself, or my wonderful wife and partner, JoAnn. We recently moved to our new dream home and office located on the banks of the pristine McKenzie River in Vida, Oregon. It is here that we invite you to join us anytime by appointment and enjoy the natural beauty of the circling ospreys while you play your flute at the rivers edge. The river has always been a healing place for me and is the inspiration for many of my personal vision flutes. I hope you enjoy your visit and take some time to relax as you see the rest of the story.